It's the Rheo Thing: Is Ketchup Really Thixotropic? And Does it Matter? Is Ketchup Really Thixotropic? And Does it Matter? It is becoming common knowledge that ketchup is "thixotropic". More and more people are beginning to talk about it, which means that this is a good time to put the idea to the test. In addition, the Grand CENtral blog is sponsoring a #FoodChem carnival this week, so this is my entry. What most people have observed is that ketchup is a thick fluid, and in glass bottles in particular, very difficult to get flowing. However, once the flow starts, it flows quite readily, usually leading to too much ketchup ending up on your burger and fries. The question is how do rheologists describe this behavior and is this sudden onset of flow really due to "thixotropy"? Before we can get into that discussion, there are a few terms that I will define as they all play a role in the rheology of ketchup. 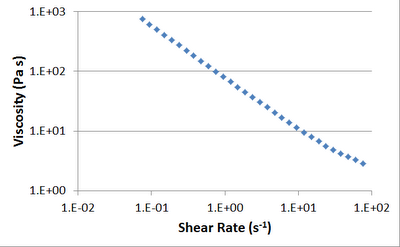 But before I can get to those terms, I'm going to discuss what I mean by shear and shear rate. While there are mathematical definitions, I'll skip them for today and just describe these ideas qualitatively. For any liquid that is flowing, the velocity of the liquid that is right up against the wall is zero , while the velocity of the fluid elsewhere is not. This means that the fluid is being sheared. The faster the fluid is moving, the higher the shear rate is, but also, the smaller the gap in which the fluid is moving, the higher the shear rate. For a run of the mill liquid such as water, the viscosity of it is constant regardless of the shear rate. That makes it a Newtonian liquid. If the viscosity is not constant, then it is a non-Newtonian liquid. Non-Newtonian behavior comes in many flavors, but I'm only to going to discuss three options today. The first is "shear-thinning". 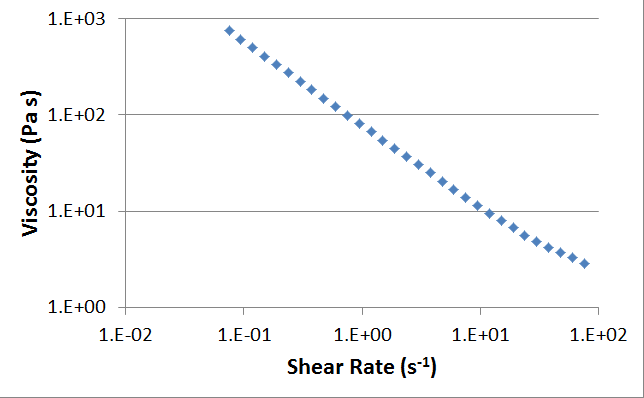 A shear-thinning liquid is one where the viscosity decreases as the shear rate increases. Second is the le mot du jour, thixotropy, which is similar to shear-thinning but also decidedly different. 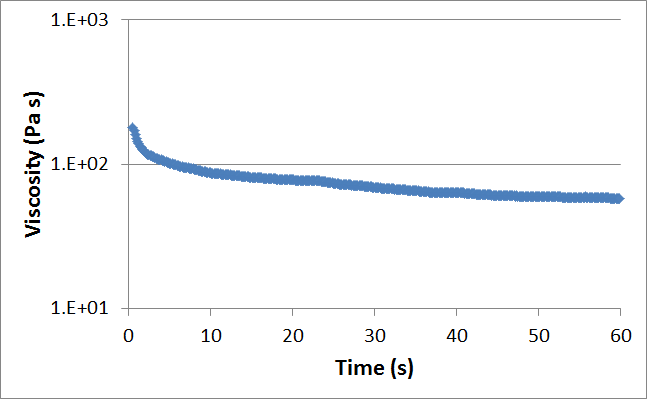 At a constant shear rate, a thixotropic material will show a decrease in viscosity over time. Last is "yield stress". This is the idea that certain materials need a minimal amount of force applied to them in order for flow to start. If less force is applied nothing happens. It is possible for a non-Newtonian fluid to exhibit any combination of these characteristics. Ketchup in fact shows all three behaviors. But enough with the academic terms, let's get on with the show. 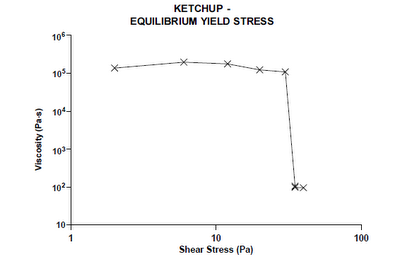 The plot below shows the viscosity of the ketchup as the shear rate increases. It drops, so you can say ketchup is shear thinning. This an important property for ketchup that is in squeeze bottles, as it makes it easier to dispense through the narrow opening - a region of high shear. 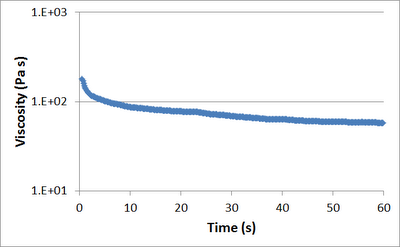 The next plot shows what happens when I subjected the ketchup to a constant shear rate. Over time, the viscosity drops, so yes, ketchup is thixotropic. I would have loved to have taken the data for this last plot, but I have the wrong type of rheometer for it , so I am borrowing a plot from TA Instruments. 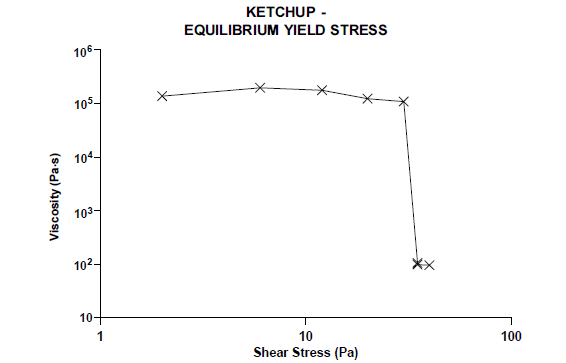 This plot shows that ketchup also has a yield stress. A certain amount of force is needed to get it moving in the first place. So the question is this: when you get a big glug of ketchup shooting out of the glass bottle, is it due to the shear-thinning, the thixotropy or the yield stress? Despite the trendiness of the term, the thixotropy is the easiest candidate to eliminate. Look at the small drop in viscosity. It's just not significant. And while the shear-thinning plots shows a large drop in viscosity, you need high shear rates to achieve that and you won't find that in the big part of the bottle - it's just too big a gap. So that leaves yield stress as the winner. Look at the plot of yield stress again. The viscosity suddenly drops by a factor of 1000 just by reaching a critical stress! That's why you suddenly get a massive amount all at once - you finally reached the yield stress. While ketchup is indeed thixotropic and I am glad that more and more people are becoming familiar with rheology, that phenomenon is the least of your concerns in getting the ketchup out of the bottle. This is a very fundamental concept in fluid mechanics known as the no-slip boundary condition. This stuff is a pretty soft gel, so by using larger diameter plates and their associated larger torque, I am generating a larger signal for the instrument to pick up. Also, the plates were coated with 600 grit sandpaper in order to minimize slip at their surface. My rheometer subjects the sample to a strain (deformation) and measures the stress (force). The type of instrument I need for a yield-stress plot is one that subjects the sample to a stress and measures the strain. Santa, I've been a good little rheologist this year. Can I please have a controlled-stress rheometer for Christmas? I totally agree with you. A complex fluid may possess many rheological characteristics, like what you have shown here, Ketchup! Some people argue whether yield stress really exists, it is very process-dependent. For instance, it is hard to squeeze ketchup out of the bottle, but it is much easier to spread the ketchup on our food. I am not sure if you “a good little rheologist” agree with this or not. Happy Holidays! You are correct that there is ongoing research into the existence of a yield stress, and whether it is in fact a very short, steep transition. I certainly wasn't going to get into all today, as this designed for a more general audience. Either way, that transition is why glass ketchup bottles are so maddening. 20+ years ago, I was taught in Chris Macosko's course that it was a Bingham plastic. Is that another description of a material that has a yield stress? The salient feature of a Bingham plastic is that it has a yield stress, so yes, ketchup is a Bingham plastic. Hi can anyone help me with ketchup's rheological properties, namely consistency index (k) and flow behavior index (n) values. I am using ketchup as my non-newtonian fluid, in a excel spreadsheet computer programme that calculates pressure drop and required pumping power. Any help would be greatly appreciated. Can anyone help me with the rheological poroperties of ketchup. Properties include flow behavior index (n) and consistency index (k). I'm using ketchup as my non-newtonian fluid in an excel spreadsheet to write a computer programme that calculates the pressure drop and required pumping power. Any guidlines/pointers or tips are welcome. Water is one of the most precious organic sources we have on this earth. However, this organic source has been taken for provided long enough. As the world's inhabitants is growing our sources keep falling. About five and a half years late, but I was searching for "what makes ketchup thixotropic" as I am trying to make a thixotropic version of mayonnaise and my searches for thixotropic food additives keeps bringing up ketchup. Don't want to disparage your research, but I doubt you have taken into account sufficient variables to decide if tomato ketchup 'glugs' relate to yield stress, shear-thinning or thixotropy. Bottle design, how full the bottle is, how well it was shaken and how easily air gets into the bottle are likely to be as important as the 'resting' characteristics of the ketchup. If you start of with a half empty bottle, shake it well, allow it to stand for a moment or two to clear the neck and then tip it slowly to ensure that air flows in without restriction, you are likely to end up with a steady pour without a 'glug'. Trying to get ketchup to flow out of a full bottle is another matter entirely.